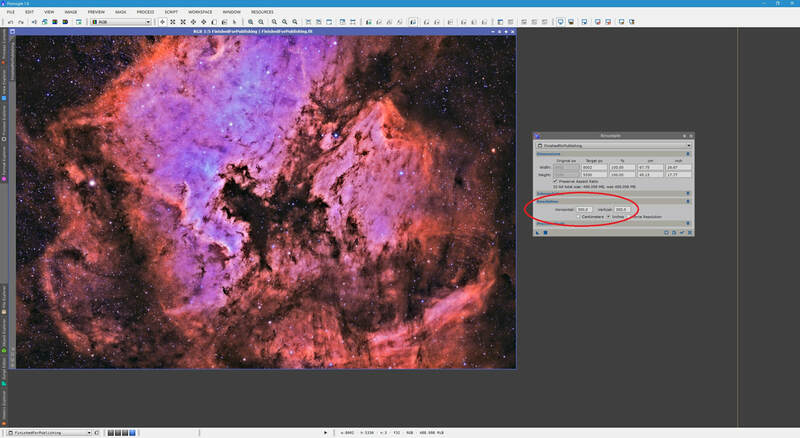 Finishing post-processing an image will always be followed by a rush to get it out there. No doubt you will be keen to show others what your hard work has yielded, be it online or in print. There are a number of things you may wish to do to your image before publishing it as a finished product. This tutorial covers just those things. You need not do everything listed here (or anything​ for that matter! ), but this tutorial follows a somewhat thorough procedure for publishing your images. The colour profile is first converted using ICCProfileTransformation, depending on where the image will end up. The image is then resized according to pixel and/or resolution requirements, using Resample. A border is added around the image as a placeholder for your name and website, using Crop. Objects of interest in the image as well as your actual name and website address are annotated on to the image using Annotation. Finally, the image is saved in appropriate formats for various publishing mediums. 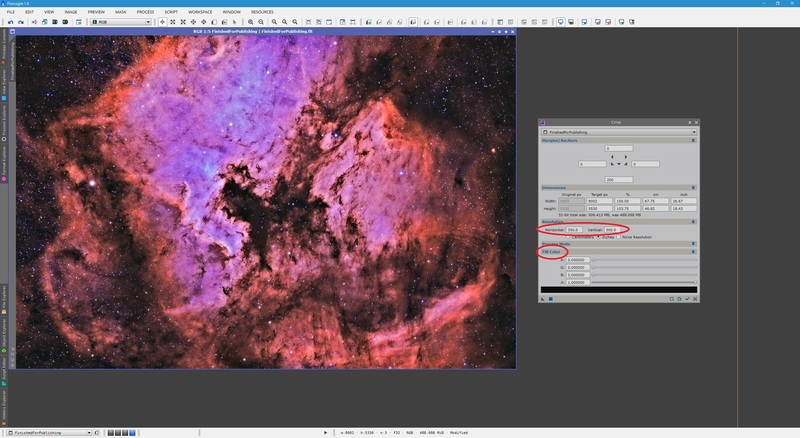 Knowledge of operating PixInsight, related to dealing with colour profiles, images and processes (read this, sections 2, 3 and 4). Your image has been fully pre- and post-processed and is considered finished ​for all intents and purposes. Please feel free to ask questions or leave comments via the comments section on the bottom of this page. PixInsight by default uses a colour profile to display images within it. If you have followed the Introduction to PixInsight tutorial, you will have probably set the Adobe RGB (1998) colour profile as default. This is however not the official colour profile for the Internet, nor is it necessarily the colour profile used by a printer you may want to use to print your images. We start with the finished product opened in PixInsight. ​​We are going to assume this image will be published online. The procedure will be identical for an image that is intended for printing, besides ideally selecting the printer's colour profile. First and foremost, we save a new copy of the image with a different name so that any changes made to it are not made to the actual finished product. The new copy of the image is still saved as a 32-bit FITS image, as was the finished product. There is no real reason to change that up until the very end. Next, we open the ICCProfileTransformation​ process. ​Here, we select our open image from the top list under Source Profile. This will tell us what colour profile the image is currently using. Since we are going to be publishing this image online, we will select the standard colour profile for the Internet. First, enable the option Convert to the specified profile under Target Profile. From the list, select sRGB IEC61966-2.1. If your intention was to print out the image and you had a colour profile set up for your printer of choice, you could select that one instead. Your printer may suggest you keep using the Adobe RGB (1998) colour profile if possible. If that is the case, ensure that is the colour profile you convert to (if it is not already set by default, as mine was). Either way, for the Internet, sRGB IEC61966-2.1 is the correct colour profile. Before we apply the colour profile change, select Perceptual (photographic images) from the list under Rendering Intent and make sure both options Black point compensation and Floating point transformation​ are enabled. Once done, simply click Apply​ and close the process window. ​The image's colour profile is now prepared for publication. We now deal with the idea that we may want to resize the image before publication. At the very minimum, you may want to adjust the resolution (pixels per centimetre/inch) so that printing reproduces the image faithfully on paper. This is done using the Resample​ process. We start by selecting the image from the list at the top, so that the original values are populated automatically and you know what you are working with. ​It is very rare that someone would want to purposefully reduce the pixel size of their images before publication, unless they are trying to reduce filesize or are trying to hide imperfections that when downsized, become less visible. 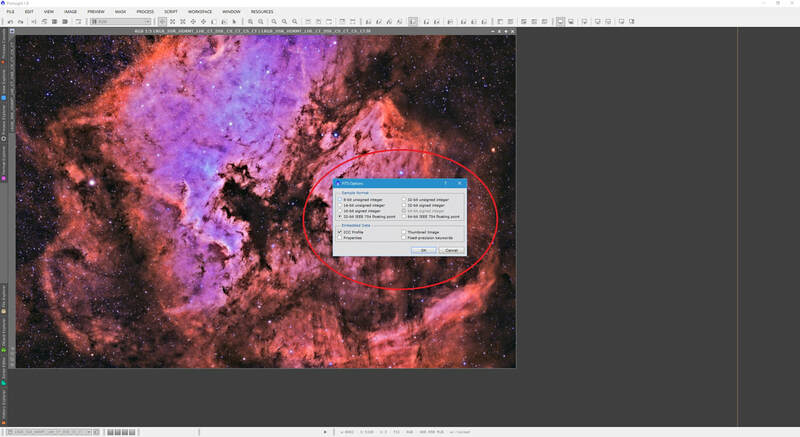 If you wish to reduce the pixel size of your image, simply enter a new value under Target px for Width or Height (the other one will adjust automatically to maintain the aspect ratio). I will keep my image pixel size constant but I will raise the Resolution from the default of 72 pixels/inch to 300 pixels/inch. The image size in centimetres and inches is adjusted accordingly, since I am forcing more pixels to fit into one inch by increasing Resolution. The pixel size is still 8002 x 5330 however. Once you are happy with your settings, simply click Apply and close the process window. ​In preparation for annotating my name and website on the image, I will add a border to it. The Crop process is particularly good for this as it allows you to specify by how many pixels and to work with individual sides, with a border colour setting included. Before we start, we make sure the image is selected in the list at the top. This will populate the process with the image's properties. I would like to add my border to the bottom of the image. Given that the height of the image is 5330 pixels, a suitable border height would be 200 pixels, I estimate. Therefore, I enter 200 (positive, in order to expand the image rather than crop it!) on the bottom text box under Margins/Anchors. Doing so automatically increases the Height under Target px to 5530. If this was decreased to 5130, I would be cropping rather than expanding. ​By default, Crop has the Resolution set to 72 ​pixels/inch. Since we modified our image's Resolution to 300 pixels/inch, I will need to adjust the setting in Crop to ensure what I did earlier is not undone. For this, we expand the Resolution tab and enter 300 in both text boxes. Moreover, I would like the border to have a dark grey colour, as opposed to the default black. To adjust the border colour, we expand the Fill Color tab. ​Under R, G and B, we can enter Red, Green and Blue values between 0 and 1 to create the colour we want. All shades of grey are simply colours that have the same R, G and B values and since 0 represents black (1 represents white), I simply need to enter the same low values for all three. For example, R, G and B values of 0.150000 are suitable. The bar along the bottom (by default, black) will take the colour corresponding to the values you enter (as a preview). Once happy, we click Apply​. 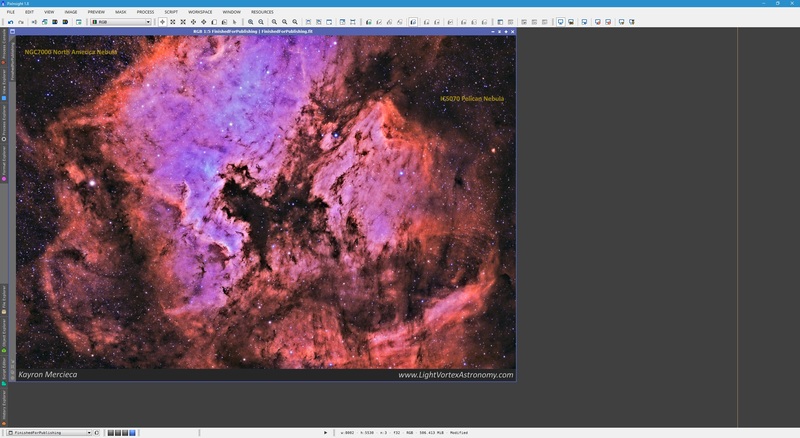 With the dark grey border added to the bottom of the image, the Crop process can be closed and the image saved. PixInsight has a process not often used - Annotation. This process does exactly what the name suggests - allow the user to annotate text on to images. Since it is classified as a form of painting, PixInsight looks upon it with an elitist look on its metaphorical face. However, since I wish to add my name and website address to the bottom border of the image, I will make use of this process. The text you would like to add is simply entered into Text. The option Show Leader is disabled by default. This is only enabled if you would like the text to have a pointing line attached to it (to point to objects in the image). We will look at this feature in a bit, but for now, my name requires no pointing line. Under Font, you can select a desired font and set a size. You can also add styling options such as Bold, Italic, Underline and Shadow. A colour can also be selected from the preset list. If you would like a custom colour, simply click the coloured rectangle next to the colour presets list. R, G and B values can then be entered manually. An Opacity can also be entered for the text to be invisible (0), transparent/translucent (1 to 254) or opaque (255​). To add the text to your image, click anywhere on the image while the Annotation process is open. As you customise the options such as those under Font (or you change the Text itself), changes will be made to the text on the image. You can click and drag the text on the image to move it anywhere you like. When you are happy with the text's placement and style, simply click the Execute button on Annotation (green tick icon). This will permanently add the text to your image. You can obviously undo the changes made to the image if you are unhappy afterwards. Once one string of text is added, you can click the image anywhere again to add another string (in this case, I will add my website address). We can also add labels to the image itself, to point out the individual features such as nebulae names and catalog numbers. In this case, we will enable Show Leader as we would like the pointing line there. To point the line anywhere you like, simply hover the mouse pointer over its point and you will be able to click and drag it anywhere on the image. The text can also be placed anywhere. You will quickly realise that the pointing lines are not particularly bold and can be very difficult to see except when over background. This makes using these with bright images generally not a good idea. It is however a nice way to present several small galaxies, star clusters or individual stars against a dark background. Once you are happy with having added all the text strings you wanted, simply close the Annotation process and save your image. ​With your image ready for saving as a different format other than 32-bit FITS, we now consider where this image will end up. To maintain contrast, ideally we would save at a minimum bit depth of 16-bit. A particularly good format to retain this level of information is TIFF​. When saving as a 16-bit TIFF, select 16-bit unsigned integer and None under Compression. You may enter the image description and your copyright information here as well. 16-bit TIFF images are particularly good for later printing, as they retain a large dynamic range and do not show visible compression losses. If however you are intending on publishing this image online, as we are here, then 16-bit TIFF will produce too large a filesize. Some image hosting websites will not accept such large files, or will introduce their own compression on top which will ruin your initial good intentions. The two main formats for online publication are PNG and JPEG. Both are 8-bit, so a lot of information in the dynamic range is compressed. However, you may not see the difference with your eyes as your monitor is likely an 8-bit monitor anyway (so it is already compressing 16-bit images visually). However, the JPEG format tends to introduces odd gradients due to compression losses, even when set to 100% quality. PNG is therefore an excellent 8-bit format to use, unless you really want to reduce filesize (then JPEG set to 100% quality is your best bet). If saving as a PNG file, you will not be asked anything. The file will simply be created. If saving as a JPEG, you will be asked to set a Quality value. The default is 80, corresponding to 80%. Always increase this to 100 for 100% (maximum quality JPEG​). As a final reminder, use 16-bit TIFF for printing and PNG or JPEG at 100% quality for online publication. If you can choose PNG, go for it. If you wish to reduce filesize, use JPEG set to 100% quality. Another way of reducing filesize further is to downscale the image's pixel size. To do this, simply use the Resample process but reduce the values under Target px. Ensure the values entered under Resolution are appropriate for your needs. The default of 72 pixels/inch is perfectly fine for online publication. Higher than this is only really beneficial for printing.